The rise of contactless payment is spreading. Cash has been around for quite a while now. We’ve all used it, grown up with it, most of us cannot imagine a world without cold hard cash. Well, it could soon be time to wake up and smell the coffee! We all know those times when you’re enjoying a night out chatting with friends in some pub or venue. The conversation gets involved and everyone is fully enjoying the experience, however you fail to notice that most of the clientele have left and the staff are patiently waiting for your party to leave. Most of us have been there I’m sure. The exchange of goods used to be loosely based on killing and stealing back in primal times. Thankfully, this changed to bartering for the benefit of all. Bartering – Humanities earliest known value exchange system first appeared around 6000BC in Mesopotamia. Obviously, storing up goats or camels for an unknown financial emergency is great! Just, not very practical when we are talking about minor purchases. The Kingdom of Lydia (now Turkey) liked the look of bartering but thought they would switch things up a bit and became the earliest historical evidence of coin use. These coins were made from a naturally occurring mixture of gold and silver called electrum. The coins were not identical in shape but their weights were carefully measured. This was the start of cash. Not cash like we have now though. This old world cash actually had value, e.g. its weight in precious metal. For a good breakdown of all forms of money to the present cash system. Moving swiftly forwards a few centuries, cash is prevalent in society and this has been the status quo for a while. No mention of credit cards? Not really. In this instance credit cards are more temporary loan organisers than cash transfer tools. The influence of credit cards did however give birth to the debit card. Debit cards are something a little different though; they generally allow you to use your cash without carrying it on your person. Debit cards have also only been around roughly 34 years. The debit card requires a manually entered PIN which authorizes the holder to withdraw funds from a linked account. As most of the World are beginning to use contactless payment, some countries have been putting it into practise at a startling rate. China, in particular, have grabbed the contactless bull by the horns and are riding it like a show pony! 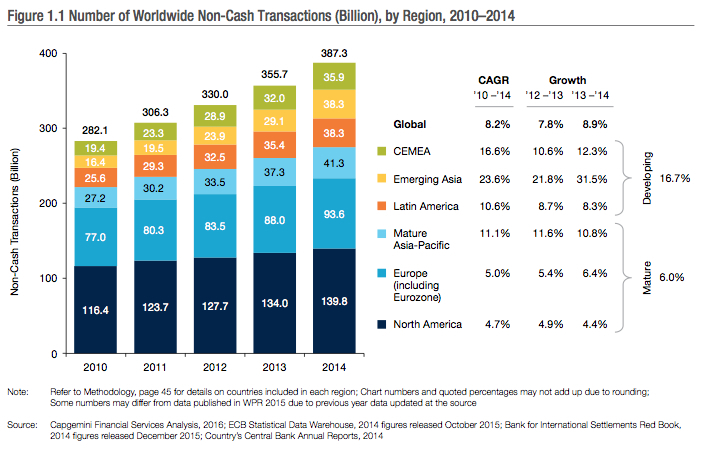 Last year, China moved into fourth place for non-cash payments worldwide. China are just under US, Europe and Brazil. China has over 4 billion debit cards issued. Given the population of China, that is nearly enough for adults to have 3 each. In China’s top-tier cities – Shenzhen, Shanghai and Beijing , it is considered trendy and convenient to pay without cash. They also have the largest proportion of individuals worldwide using mobiles to make their payments, both online and in the physical world. There are a number of pre-paid cards and electronic wallets in use currently. Wechat, Mi Wallet and, of course, Alipay. These have become very popular, more so with younger people. Outside of the city though, in rural areas, people still prefer using cash. In other parts of the World, the central bank of S.Korea has declared the country will go fully cashless by 2020. NFC (Near Field Communication) is available on most new smartphones. Also, The City of London in The U.K. has already introduced a contactless payment scheme for buskers. This give street performers the possibility to accept money via cards, phones and smart watches. Get your QR codes printed and be ready for the change; physical money could soon cease to be so widespread. With the unfettered rise of blockchain technology and automation, it is only a matter of time until this tech is firmly integrated into every level of civilisation.